Published: . Filed Under: Raising Kids. Until I reached my thirties, I was always sick at Christmas. It became sort of a joke in my family. Like clockwork in mid-December, I would get a terrible cold that would turn into sinus pain and sometimes an infection. When I was a teenager, I relied on over-the-counter medications to relieve the congestion and the sinus discomfort. My son is only 2.5, but so far he’s doing a good job at keeping up with my track record of illness during the holiday season. When he was eight months old, he got his first cold and fever right before Christmas. Last Christmas he was sick again. And this December so far he’s getting over a November cold but still has a cough, one that has lingered for weeks. When you hear your small child coughing in his crib all night, it’s hard not to want to treat him immediately. Especially during the holiday season, when families have so many obligations and events, everyone just wants a good night’s rest. 1. Do not give cough and cold medications to children under four unless your doctor specifically tells you to. Just because we can get these medications at any grocery or drug store, it doesn’t mean that they’re harmless for little kids. Your young child’s body processes medicine differently than your adult body. Because of this, some OTC medicines are made only for children or have specific dosing instructions for children. Do not give medicines made just for adults to your child. Talk to your family doctor if you have any questions about giving your child OTC cough or cold medicines. 3. If you do choose to give a medication, make sure that you use the measuring device that came with the medicine. Don’t use an ordinary kitchen spoon to measure liquid medicine. You could also ask your pharmacist for a measuring device (such as a spoon made for measuring medicine, or a syringe or a cup) that is labeled with both teaspoons (tsp) and milliliters (mL). 4. Always keep all medications, including OTC ones, up and away out of the reach of children. Lots of us travel during the holidays or have guests in our homes. Make sure that you keep the same safety routines when you travel, and medicines are not kept in bags that children can get into. Also, tell guests to put these medications out of reach as well. 5. Remember that these medications will not cure the cold or the flu; they may only help relieve some of the symptoms of the illness. Giving more medication — more than the recommended dose — is dangerous and will not help your child get better faster. 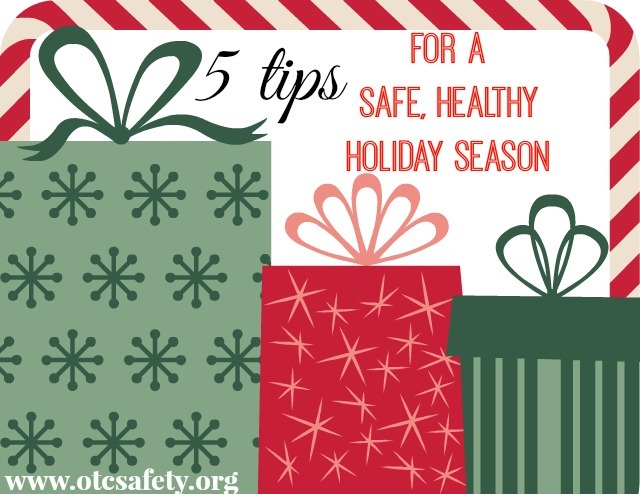 Do you have any tips for making the holidays easier for a sick kid? I wish you and your family a healthy and happy holiday season! Have you heard of rubbing Vicks (or natural oils) on the bottoms of their feet to help with congestion? I hope your little guy is better by the holidays!! One thing that works well for us is to prop our son up at night. When he’s congested, it’s often the drainage that wakes him up. These are great tips for parents. It is very easy to over-medicate a baby. We love Zarbees for coughs. It is a natural and it works very good. My poor baby had a horrible cold and the pharmacists recommended this product for my son and Allegra too to help with his allergies. Of course my son was two and we were able to give him meds. The pediatrician’s office suggested giving a table spoon of warm water when he was a bit younger to help loosen the chest congestion and thin the mucous. Chevy Sail Sedan mileage is equally attractive with maximum of 18. Chevrolet Sail Sedan comes packed up with 1199cc DOHC, 1.
another one has a beautiful emblem.